We have made this page as plain and straight forward as possible. The growing popularity of the Shorkie is not without its downsides. Unfortunately, there are many Shorkie breeders appearing on the scene who appear to care little for the dogs they raise or for the customers they service. These types of breeders are commonly referred to as backyard breeders (byb) and/or they could even be puppy mills/puppy farms. Ask yourself this one question . What type of a breeder would SELL and innocent helpless puppy to sit in a store and wait to be adopted. Can you imagine how scary it is for that puppy? The pet stores don't care who adopts the puppy. Responsible breeders never to sell to pet stores and being a responsible dog owner means never buying from a pet store. What is a puppy mill, and why should you care whether the puppy you buy comes from one? Puppy mills are large-scale breeding businesses producing large numbers of puppies for profit, and only for profit. They do not try to better the breed. They are like factories manufacturing puppies! – and they are run by people who have no idea about or concern for genetics or any kind of responsible breeding program. It’s all about greed and money, not the well-being of the adult dogs and the puppies. In fact, most puppy mills are deplorable in their treatment of both the breeding dogs and the puppies produced – kenneling them in filthy conditions without proper veterinary care, nourishment or socialization. And when the breeding parents can no longer breed, they are killed, starved to death or they are dumped near death and left to die in some remote place. Puppy mills may sell through classified ads, websites and pet stores which typically work through a broker or a middleman. The best way to not support puppy mills is to deal directly with a breeder, research and do your homework on him and check his references – both those from the breeder’s other puppy parents and from the breeder’s vet. Responsible breeders will never knowingly sell to a broker, a pet store or a byb. What is a byb? Backyard breeders are people who breed for many different reasons. Their one common bond, however, is that they usually know very little about what they are doing. Some bybs breed just for the sake of breeding, some so that a beloved dog they already own can be reproduced for themselves or a friend, some so their children can see a birth, and, of course, some do so to try to make a few bucks. Whatever the reason, it usually comes down to someone who breeds dogs without understanding the breed standard and the genetics of achieving it, nor are they doing the necessary genetic testing to troubleshoot problems. Some may not understand why they shouldn’t be breeding, and they may start out intending no harm. But they’re breeding for reasons other than improving the breed – and sometimes they even get in over their heads, ending up with too many dogs to care for properly. Like the puppy mills, usually bybs also sell through classified ads, websites, brokers and pet shops. We Want People to Take a Stand with Us and Say No to Pet Shops! When a breed becomes popular, which is what’s happening with the Shorkie, backyard breeders, puppy mills and puppy farms want to jump on the bandwagon. They spring into action, and mass production, i.e., puppy manufacturing, begins in order to meet the demands of the public. Not only is mass production of puppies the largest contributor to pet overpopulation, but the quality of the puppies being produced is diminished significantly. In fact, breeds are ruined by indiscriminate breeding for profit without consideration for health and temperament. The mass production breeders sell their puppies to brokers who go around buying up the new, hot breeds. The broker then turns around and sells to the pet stores. Much as a pet store may claim to use reputable breeders, it’s sadly not the case – a reputable breeder would just never knowingly sell to one! Each pet store puppy sale encourages puppy mills and bybs to churn out more and more innocent puppies (and kittens), who are in turn again brokered back to pet stores for more sales. The sick cycle never stops. Breeders should be responsible for the lives they bring into this world, especially when you consider that approximately 130,000 dogs and 60,000 cats are killed at pounds every year. Breeders should not be indiscriminately breeding and contributing to this tragedy. Impulse buying is the goal of irresponsible breeders who breed for profit and greed and who are out to make a quick buck. These breeders know that it’s hard for many people to resist the temptation to buy that cute puppy or kitten sitting in a pet show window. In fact, they count on it, and they know emotions will tug at people’s hearts and cause them to ignore that these poor pet store animals come from bybs, puppy mills and puppy farms! I get probably 50 calls every week from people all over the USA telling me about the issues they have had with a breeder of a Shorkie or that the puppy itself has died or is very sick. The only thing I can tell them is to contact the breeder they got the dog from. If there had been a problem with an SCA breeder, I could assist them. But I have no jurisdiction over breeders that are not SCA members or petshops for that matter. So, please, before working with any Shorkie breeder, check with us to see if it is a breeder we recognize and work with. As I’ve said, I will be glad to personally let you know if the breeder you are considering is an SCA breeder. 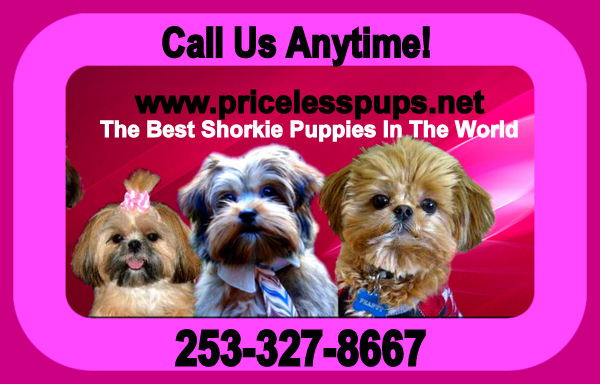 (Email pricelesspups@yahoo.com; or telephone 253-238-7936, Pacific Time Zone.) I will happily help you. The Priceless Pups family is championing the need for change in the USA when it comes to ethical breeding practices. It’s time for responsible breeders to take a stand and step out and away from breeders who are breeding without understanding what they are doing and/or are just out to make a quick buck. We are doing everything in our power to ensure we are breeding to better the Shorkie breed. If breeders are doing nothing to better the breed, then what business do they have breeding at all?